This guide walks you through the ins and outs of Apple Pay, how to use it at stores and online, and how to accept it at your business. We now look to our phones to help us take care of daily life—everything from checking the weather to plowing through email or monitoring our health. So it only makes sense that people are increasingly using their smartphones as a way to pay for things at stores. Apple Pay is perhaps the buzziest example of these new mobile wallet services. Apple Pay is Apple’s mobile wallet. In stores, Apple Pay allows you to check out and pay by holding your phone over a payments reader that can accept Apple Pay. In apps and on websites, Apple Pay allows you to trigger a payment from just a tap on your phone. Which Apple devices have Apple Pay? In stores, Apple Pay works on the iPhone 6s and 6s Plus as well as the Apple Watch. In apps, Apple Pay works with the iPhone 6, iPhone 6 Plus, iPhone 6s, iPhone 6s Plus, the iPad Air 2, iPad Pro, and iPad mini 3 and 4. How can I get Apple Pay? To get Apple Pay, first open up Wallet on a supported Apple device. Then, using your device’s camera, take pictures of the credit cards you’d like to load into your mobile wallet. If you already have a card associated with your iTunes account, you can use that as well. To use Apple Pay at stores, just hold your device up to the NFC-enabled reader with your finger on the Touch ID button. That triggers the payment. There’s no need to open a new app or wake up your phone to use Apple Pay. But Apple Pay isn’t just accepted in stores — you can use it within certain apps and websites as well. There’s no NFC reader involved in these transactions. If you’re using Apple Pay in an app, just place your finger on the Touch ID button or authenticate with your password. If you’re using it on a website, click the “Buy with Apple Pay” button on the checkout page and then trigger the payment with the Touch ID on your phone. You can use Apple Pay within the apps and websites of businesses including Caviar, Target, Airbnb, Groupon, Etsy, and Sephora. With Apple Pay, your credit card number is never actually stored on your device. Apple assigns a unique number to every purchase, so your payments stay secure. If your phone is lost or stolen, you’re also protected by Touch ID, Apple’s fingerprint technology. Besides being secure, Apple Pay payments are quick to process. The transaction takes just seconds, which is noticeably faster than credit card transactions (especially EMV transactions). How can I accept Apple Pay at my business? To accept Apple Pay at your business, you need a reader that’s equipped with NFC (near field communication) technology. The Square chip and contactless reader is enabled with NFC. If you run an online store, you can also accept Apple Pay through your app or website. You don’t need a reader for that, but your developer needs to use a checkout and payment form, or an API that supports Web Apple Pay. Start selling with Square Reader for contactless and chip. Accept chip cards and contactless payments for one low rate per dip, tap, or swipe. If you own a business, it’s a good idea to stay up to speed with the latest in new payments technologies, like Apple Pay. As Apple Pay continues to take off, people will want to use it at your store, so being familiar with how things work on the buyer side of things will help prevent any fumbling on your end. And the best way to learn about Apple Pay is to try it out for yourself. It’s relatively easy to enable Apple Pay on your device. To set it up, first open up Wallet. The next step is to load up the credit or debit cards you’d like “on file” in the system. Apple Pay works with most major credit and debit cards from U.S. banks. You can check a full list of banks that participate in Apple Pay on Apple’s site. When you add your participating cards to your Wallet, you still get all the rewards, benefits, and security features of your cards. So how do you actually add a card to Apple Pay? If you already have a card associated with your iTunes account, it’s super-easy. Just select the option to add that card to Apple Pay by entering the security code that’s on the back of your card. If you don’t have a card on file for your iTunes account, you just need to go through a few more steps. Use the iPhone’s camera to take a photo of your card and fill in any additional info the app asks for (like your security code). After your card is verified, voilà—you can start using Apple Pay anywhere that accepts it. Apple’s site has a handy step-by-step guide for how to set yourself up with Apple Pay, if you need some more help. Apple Pay works with most major credit and debit cards. Many large retailers across the country accept Apple Pay—Walgreens, Whole Foods, Petco, and Sephora, to name a few. Apple’s website has a full list of larger retailers who now accept Apple Pay at the checkout counter. You can also check Apple Maps to see whether a store near you accepts Apple Pay. Just choose your location and look for the Apple Pay marker. 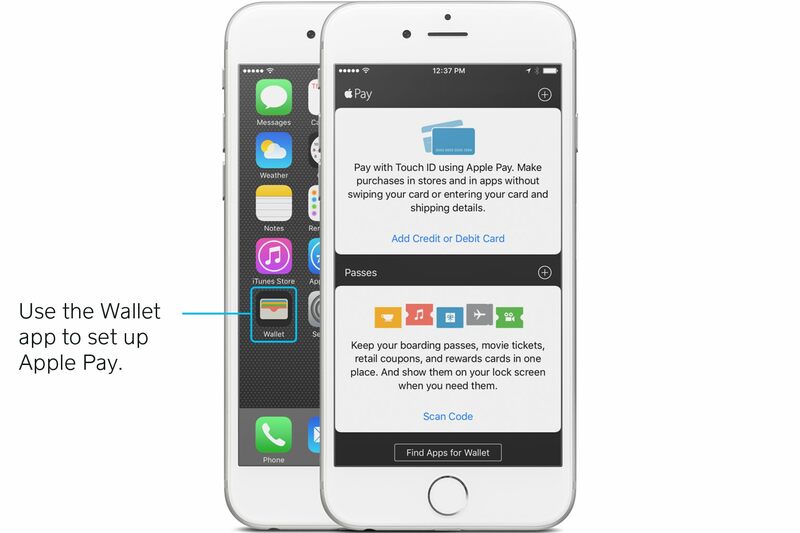 On supported iPhones and iPads, you can also use Apple Pay to make purchases within apps. Apps like Airbnb and Target accept Apple Pay. You can check out a list of apps that accept Apple Pay on Apple’s site. As we mentioned, Apple Pay is an example of a contactless payment, meaning you can just hold your device near the payments reader to pay. You do have to be pretty close, though—usually around a few inches or less (that’s where the “near” part of near field communication comes in). To initiate an Apple Pay payment on your phone, wait until the light on the payments reader comes on. There’s no need to open a new app or even wake up your display to use Apple Pay, thanks to that near field communication technology we talked about earlier. On supported iPhone and iPad models, you can use Apple Pay to pay for items with a single tap within apps or on a website. That means you no longer need to pull out your wallet and type out your credit card number, contact information, and shipping details. To use Apple Pay in apps, you first need to set yourself up with it, using the steps above. Then, when you want to pay for something within an app that accepts Apple Pay (the app will let you know if it does), all you have to do is choose Apple Pay as your payments option and activate the transaction using Touch ID (or the button if you’re using an Apple Watch). Complete the purchase with just a tap. If you’re on a website, choose Apple Pay as your payment option. Confirm the card you want to use and the shipping address. Then confirm your purchase using the TouchID on your iPhone or the button on your Apple Watch. We’re used to keeping our credit cards close to the vest, so to speak. So it’s understandable that you might be nervous about using an entirely new vehicle to pay for things. But Apple Pay is actually extremely secure—a lot more secure, in fact, than magnetic-stripe cards. Magnetic-stripe cards have incredibly outdated technology (they use the same technology as cassette tapes), which makes them particularly susceptible to counterfeiting. What’s more, in magnetic-stripe payments, the information is broadcast into the payments reader as-is, so your actual debit and credit card numbers are exposed through the transaction. Apple Pay transactions are encrypted and secure. Apple Pay, on the other hand, uses sophisticated technology to encrypt and protect every transaction. For one, your debit or credit card numbers are never actually stored on your device. Instead, Apple assigns something called a Device Account Number to each added card, which is essentially a code name for that card. That Device Account Number is then encrypted and stored securely in something called the Secure Element, which is a dedicated chip in iPhone, iPad, and Apple Watch. When you go to pay for something, that Device Account Number, along with a dynamic and transaction-specific security code, is used to process the transaction. So your actual credit or debit card numbers are never shared by Apple with merchants or transmitted with the payment. Each and every payment you make through Apple Pay has different information associated with it, so none of your data is stored, anywhere. What’s more, Apple Pay payments are protected by Touch ID, which is Apple’s fingerprint technology. So even if your phone is stolen, your information is locked down. You can also use Apple’s Find My iPhone feature to quickly put your device into Lost Mode to suspend Apple Pay, which is an added layer of security. Besides being a much more secure way to pay than magnetic-stripe cards, Apple Pay has two other key benefits: convenience and speed. Apple Pay transactions take just seconds. Let’s look at speed first. The sophisticated technology behind an Apple Pay transaction means that payments take just seconds. That’s faster than magnetic-stripe card transactions, and noticeably faster than chip card (EMV) transactions, which are known to be sluggish. The adoption of EMV as the standard for credit card processing, in fact, may be what accelerates the adoption of Apple Pay in the United States. When people (and merchants, for that matter) realize how long EMV transactions take, Apple Pay may become the preferred form of payment. And then there’s convenience. Because it’s all through your mobile device (which you’re probably carrying around all the time anyway), using Apple Pay means that you don’t have to carry around a wallet stuffed to the brim. And if you leave your wallet at home, you won’t be left without a way to pay for things. To accept Apple Pay, you’ll need an NFC-enabled payments reader. To accept Apple Pay (as well as chip cards), all you have to do is get the Square contactless and chip reader. It’s also really easy to get up and running. The new reader comes with easy-to-follow setup instructions so you can get set up to start taking Apple Pay in minutes. But as we mentioned above, before you start taking Apple Pay, it’s a good idea to familiarize yourself with how it works from the buyer side of the counter. Take a few test payments on your own so that you can walk customers through the ins and outs of paying with Apple Pay if they’re using the technology for the first time. 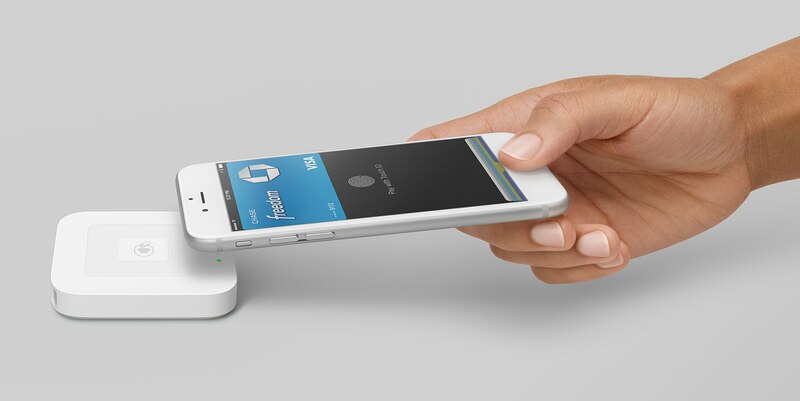 Not only does the Square contactless and chip reader accept Apple Pay, it also accepts EMV. It also covers you for the liability shift—the new credit card fraud rules that went into effect on October 1, 2015. 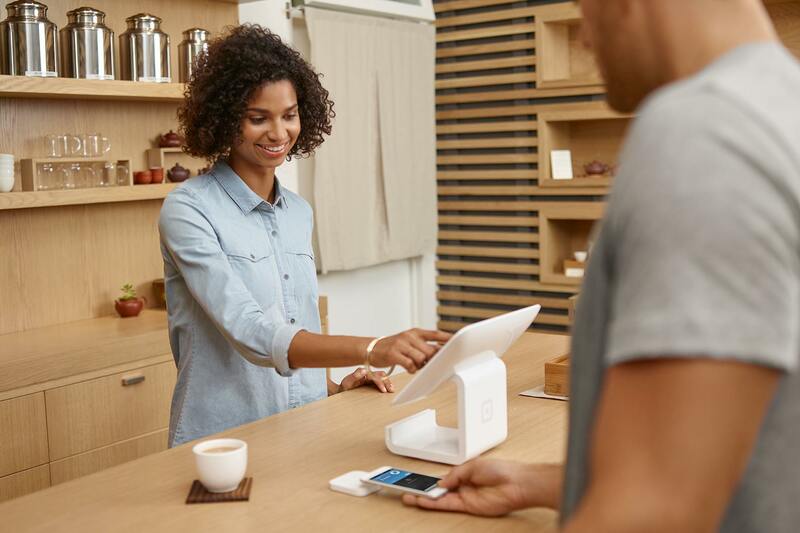 If you order a Square contactless and chip reader, Square will cover the liability shift for you until you receive your new reader in the mail. 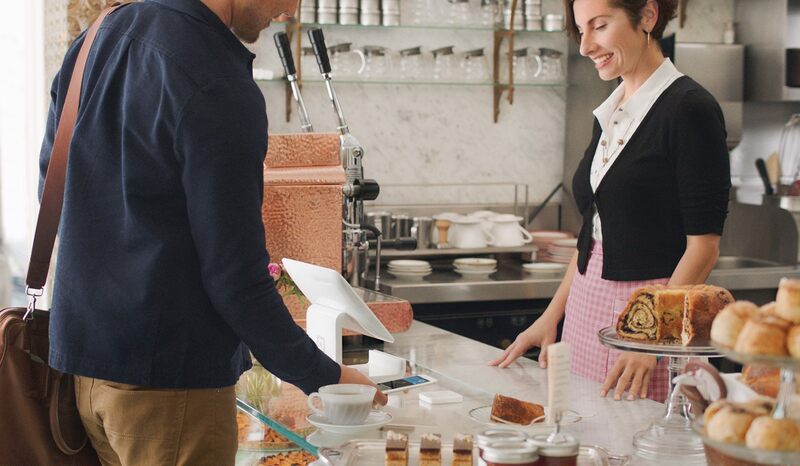 Read Square’s liability shift terms and FAQ. You can also accept Apple pay on your website. Square Checkout, a hosted checkout and online payment form that developers can implement with a single integration, supports Web Apple Pay. In addition, Square e-commerce API supports Web Apple Pay and makes it easy for developers who are building their own checkout flow to include an option for Apple Pay at checkout.